There’s no doubt in anyone’s mind that the November 2016 presidential election changed the political landscape forever and touched every U.S. resident in every corner of the country. 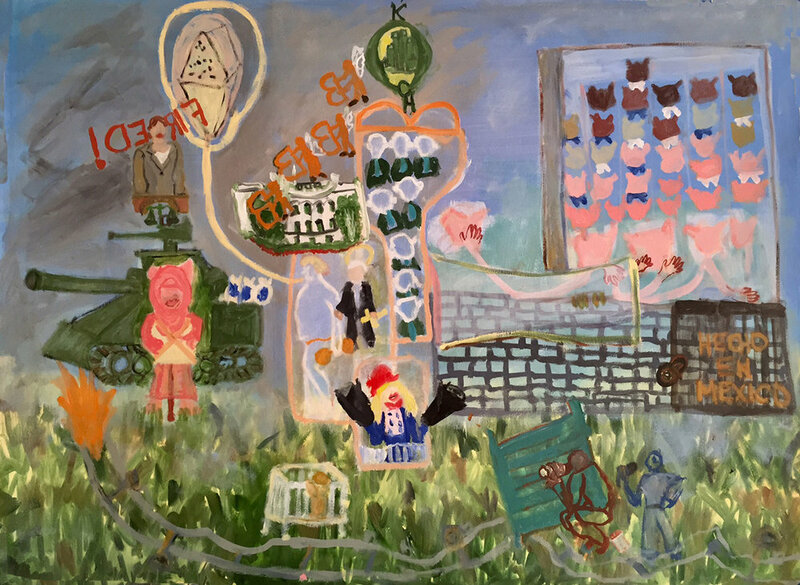 For The Painting Center’s annual juried exhibition, FIGHT OR FLIGHT, we asked artists how the turbulent political environment has affected their work. Did they become more politically active by fighting—protesting, calling representatives, writing letters or did they retreat into their studios to shut out the frenetic world? Or did they adopt some combination of both approaches? Looking back to specific artists’ reactions to unsettled times, Picasso’s Guernica and Gerhard Richter’s cycle of paintings October 18,1977 are prime examples of artists channeling the political world into their work. While in contrast, Matisse created his joyful collaged paper cutouts for his Jazz series during World War II in France, and Jackson Pollock’s poured paintings were created in the 1950's during the McCarthy era. Creativity can feed off the inspiration of current events or a personal vision.We received an outpouring of interesting and timely work, and it is our hope that this selection provides some insight into the psyches of artists responding to the times in which we live in 2017. This exhibition is in no way a comprehensive representation but rather a curated selection of work both political and apolitical. We hope that it provides a starting point for an important conversation. Artists include: Carla Aurich, Heather Beardsley, Tinka Bechert, Samantha Beste, Sarah Bielski, Maria Bjorkdahl, Larissa Borteh, Susan Cantrick, Susan Carr, Alexander Churchill, Tom Climent, Lili Cohen Prah-Ya, Michele Colburn, Daniel Dallmann, Sarah D’Ambrosio, Carlo D’Anselmi, Mary DeVincentis, Patricia Fabricant, Gordon Fearey, Barbara Friedman, Elizabeth Gilfilen, Nancy Gladwell, Hilary Goldblatt, Suzy Gonzalez, Julie Graham, Alvin Griffin, Melinda Hackett, Elizabeth Ashton Hallett, Fukuko Harris, Paula Heisen, Jesse Hickman, Amy Hill, William Holton, April Zanne Johnson, Michelle Kaufman, Ruin Kenzie, Leslie Kerby, Keri Kimura, Liliya Krys-Burhoe, Jaena Kwon, Diana Lawrence, Chungha Lim, Sally Lord, Paul Manlove, China Marks, Olivia Leigh Martin, Alan Montgomery, Andrew Nash, Douglas Navarra, Ekaterina Popova, Ana Vizcarra Rankin, Elizabeth Reagh, Scott Reeds, Claudia Renfro, Lauren Schiller, Francis Sills, Candice Smith Corby, Jeff Starr, Jeanne Tremel, Kathy Weinberg, Ava Werner, Susan Wolsborn, and Shihori Yamamoto.